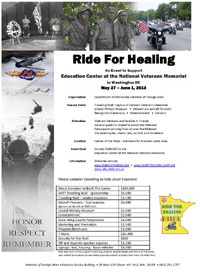 Since many Friends and Supporters of Vietnam Vets may be unable to attend this year’s Ride for Healing, we are offering an opportunity to Support the Vets through a direct donation. Below is a form that allows you to contribute directly to the State Office of Veterans of Foreign Wars. Please contribute what you can. 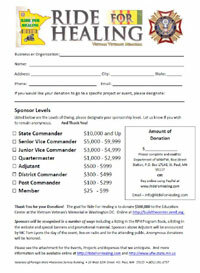 Ride for Healing Information – Click on image.